My goodness I have one free Friday! Literally Happy Friday! I just wrapped up a deadline yesterday, not that I don’t have few more to sink my teeth into again, but I think I’d grab this time for a much-needed break and do some food blogging. Baka amagin na mga litrato ng mga pagkaing niluluto ko hehe. 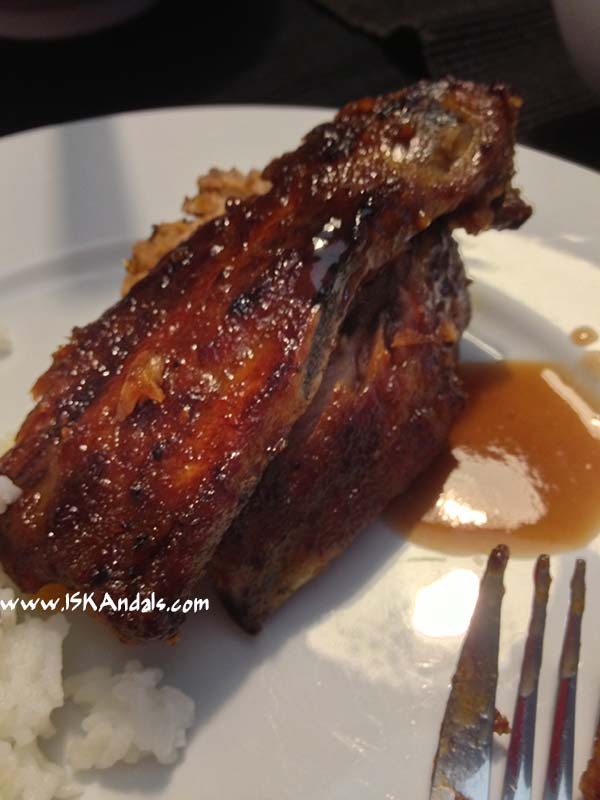 This BBQ pork spare ribs recipe has become a favorite. Why not when I combined elements I like from reading Martha Stewart and watching Jamie Oliver? Not that I’m a big fan of Martha but I am 100% for JO. Oh you will definitely love this tender, finger-licking, fall-off-the-bone goodness. Mix together paprika, salt, freshly ground pepper & Greek one spice in a baking tray. Rub generously unto spare ribs then arrange them on the tray with the fatty side up. Cover tightly with tin foil. Bake for 1 ½ hour. 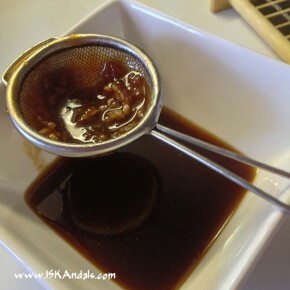 Combine all ingredients for the BBQ sauce. Taste and feel free to adjust according to your taste. Remove the baking tray from the oven and take out the tin foil. Coat over the top with BBQ sauce then, using tongs or chopsticks, flip around spare ribs to coat all sides with that scooped BBQ sauce you just put in. 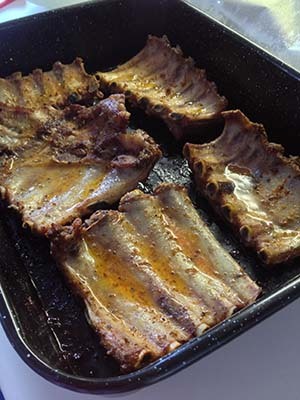 Arrange spare ribs so that the concave part is facing you (or arrange as you wish). Add another layer of BBQ sauce to coat the top of spare ribs. (Reserve the rest of BBQ sauce for dipping later). Roast under the grill 190 to 200 deg C for 5 minutes. Serve with reserved homemade BBQ sauce. Pass through a sieve to discard garlic (para sa mga galit sa bawang). Om nom nom nom. Served with steamed rice and vegetables. Mix together paprika, salt, freshly ground pepper & Greek spice in a baking tray. 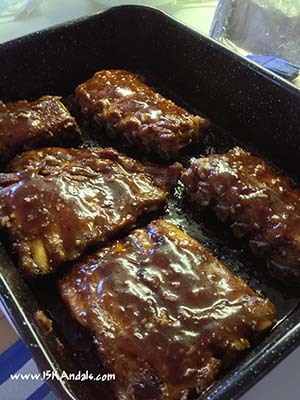 Rub generously unto spare ribs then arrange them on the tray with the fatty side up. Cover tightly with tin foil. Bake for 1 ½ hour. Combine the remaining ingredients for the BBQ sauce. Taste and feel free to adjust according to your taste. Remove the baking tray from the oven and take out the tin foil. Coat over the top with BBQ sauce then, using tongs or chopsticks, flip around spare ribs to coat all sides with that scooped BBQ sauce you just put in. 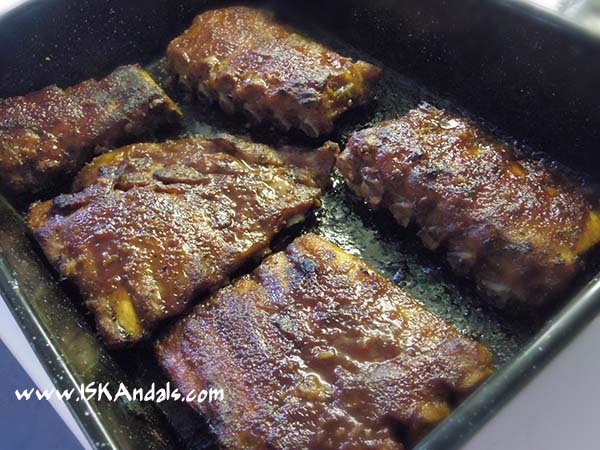 Arrange spare ribs so that the concave part is facing you (or arrange as you wish). 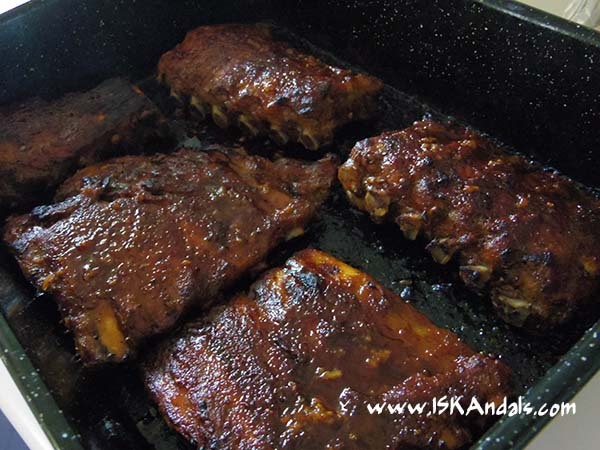 Add another layer of BBQ sauce to coat the top of spare ribs. Roast under the grill 190 to 200 deg C for 5 minutes. Serve with reserved homemade BBQ sauce. Pass through a sieve to discard garlic. Serve with steamed rice and vegetables. Prep time is included in total cook time. Awesome ribs iska! Glad you’re back! Looks yum! Will get some spareribs the next time I do my grocery and try this. glad to know you had a Friday free for blogging! those look awesome…am sooo sure my boys are going to love this, so am bookmarking this! MyTaste.com is one of the biggest recipe search engine in United States and in the world, would like to invite your blog to be featured on our site and make your recipes available to many people.